London: Allison & Busby, 2006. 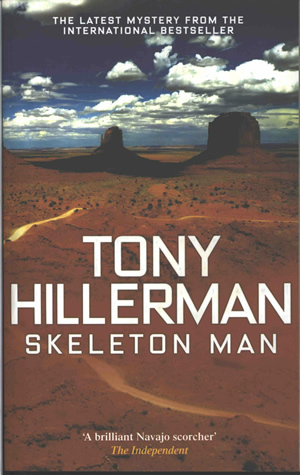 This is the UK paperback edition of Tony Hillerman's Skeleton Man, the seventeenth Navajo Mystery novel and the second to last book published in this series. This edition was published by Allison & Busby, London, England, in 2006. The cover design is by The Old Tin Dog Design Co. and features the author's name and book title in white overlaid on a photograph of a northern New Mexico/Arizona landscape, with two mesas in the background and cumulus clouds overhead. The author's name, title, and publisher's logo are printed on the spine, along with a small image of a curved knife with a wooden handle inlaid with stones. The inside front and inside back covers are blank. The back cover contains a synopsis of the novel, the curved knife image, praise for Tony Hillerman, the publisher logo, barcode, and price.